Where are you today ? When equipment plans its own downtime it is ten times more costly to get back to a safe, efficient, “run-ready” state! Moving from a reactive to a proactive maintenance environment has a big and positive impact directly on your bottom line. Did you know that when equipment plans its own downtime (i.e. a breakdown) it is ten times more costly both financially and in terms of capacity losses to get back to a safe, efficient ‘run-ready’ state? Chances are you already know you must do something to improve the reliability of your equipment but you might not know exactly what to do or how to get started. Held on the campus of The Ohio State University, this one week, fully-accredited program has been designed to introduce you to nine fundamental techniques for doing just that! Your own examples will be discussed during the session to help illustrate methods being covered. Get started on your journey to World Class Reliability today. Upon completion of this program, you will be awarded: the Manager of Maintenance Improvement Certificate by Productivity Inc. and the Fisher College of Business at The Ohio State University. Graduates of the program earn 4 CEUs. Designed for maintenance and production resources seeking a solid understanding of the fundamental techniques for improving the maintenance process. Learn how to use data to make improvements. Understand how to create provisional standards and one-point-lessons. Learn to properly plan and schedule repairs and PMs. Discover how to eliminate equipment-specific losses. Understand the proper storage and distribution of spare parts. Jim Cochran – Project Management Director – American Sugar Refining, Inc.
Romey Bryant – Manager of Production Support – Premix, Inc.
A block of rooms is being held for Productivity Inc. TPMC attendees at The Blackwell Hotel on The Ohio State University campus. Address: 2110 Tuttle Park Place, Columbus, Ohio 43210. 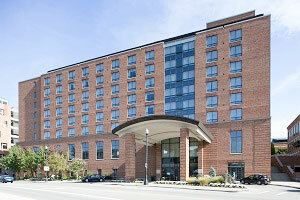 Productivity Inc. attendees receive a reduced rate of $145.00 per night, single or double occupancy. Rate includes hot buffet breakfast. Please call 614.247.4000 or toll-free 866.247.4003 for reservations, and identify yourself as a Productivity Inc. TPMC program attendee. The special rate will be available until four weeks prior to the event; after this date the hotel cannot guarantee availability. All registrant applications will be evaluated for acceptance into the program. Consultants and university faculty may not be eligible to attend. On rare occasions, circumstances may make it necessary to cancel or postpone an event. As such, we encourage attendees to book refundable/reusable air tickets. We will not be responsible for incidental costs incurred by registrants. By registering for this event, you hereby acknowledge and agree that any photographs or videos taken during the event may be used in marketing efforts, including but not limited to news and promotions (web/print) without compensation to you.